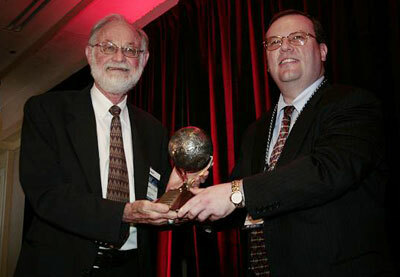 The inaugural presentation of the Gerard K. O’Neill Award for Space Settlement Advocacy was presented to former Apollo astronaut Dr. Harrison H. Schmitt (photo at left) for his outstanding efforts in support of human space development and specifically for his 2005 book Return to the Moon: Exploration and Energy in the Human Settlement of Space. 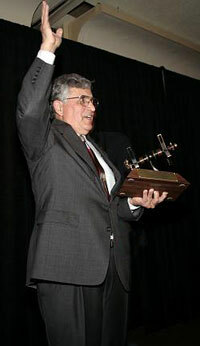 The 2007 Wernher von Braun Memorial Award was presented to Steven W. Squyres, Principle Science Investigator for the Mars Spirit and Opportunity rovers. Photo below shows Squyres (left) receiving the award from Kirby Ikin, Chairman of the NSS Board of Directors. Space Development: Presented to Kenneth J. Cox, who is the current driving force behind the Aerospace Technology Working Group (ATWG), a unique forum originally initiated by NASA in 1990 to facilitate an open dialogue between Government, Industry and Academia concerning advanced space technology issues and opportunities. Dr. Cox is also the Associate Editor of Beyond Earth: The Future of Humans in Space. The photo below shows Dr. Cox (left) receiving the award from Kirby Ikin, Chairman of the NSS Board of Directors. Special Merit: Presented to Heintz Hermann Koelle. Some of the winners of the 2007 NSS-NASA Space Settlement Student Design Contest were present at the ISDC to receive award certificates. Turkish students Can Becerik and Ahmet Okan Ozaydin received the NSS Student Space Settlement Design of the Year Award for their design called PINTA. They are the first winners from Turkey. Their deeply mathematical treatment was so impressive that NASA Ames director Pete Worden chose it as one of the three grand prize winners in the Ames/NSS annual Space Settlement Design contest, alongside entries from Uruguay and Romania. 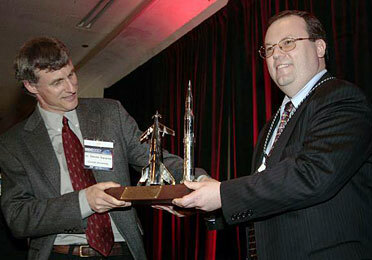 The 2007 Chris Pancratz Space Activist of the Year Award was presented to Dana J. Johnson.